Colourful Jewellery QUIZ: What new jewellery brand should you try? Which destination would you like to be jetting off to? d) A real statement which will draw attention! Lauren G Adams is for you. Bright enamel bangles in lots of designs and colours perfect for stacking or wearing alone, these beautiful bangles and rings will certainly get you lots of attention. Huge in America and the Caribbean, fabulous are the first UK stockists and they’re already flying off the shelves! Moog is for you! This genius watch concept can create hundreds of different watches, one to suit every outfit. Buy a watch face and then add as many straps as you like to your collection, you can change your strap for every occasion. Moog is exclusive to fabulous in the UK, so you’ll be the first to wear it! Qudo is for you! These fabulous bracelets are available in a wide range of colours and you can choose between Silver, Rose Gold or Gold. The magnetic clasp make them quick and easy to put on and you can choose a colour to suit your style, colouring or outfit. Pranella is for you! This Geordie Mother and Daughter duo have created these fabulous statement necklaces. In long lengths (perfect for the Summer) the necklaces are strung with beautiful semi-precious stones and feature boho charms, the perfect festival accessory or a great way to add a focal point to your holiday wardrobe! Incredibly, it’s our 10th anniversary next year, and I felt it was time to use some of our experience and expertise to help young designers get started in their careers. Sinade and I started talking with Claire Price, Acting Course Director at the School of Jewellery in Birmingham, of which Sinade is a graduate – part of Birmingham City University. Claire invited us to join the end of year Judging Panels for the degree-level course, ‘Design for Industry’ – to assess the students’ work, but also to give them help and guidance on the commercial aspects of launching a career in jewellery. We created the ‘Fabulous Futures’ award, which we will award each year to two students on the course whom we feel have real potential. Out of the twenty students that presented this year, we chose Rebecca Neil and Bethany Hancock as our first winners. Rebecca came to our Summer Garden Party as part of her award, where she showcased her beautiful wearable perfume bottles, created in fine filigree Silver. She combines traditional techniques and new technology to create timeless and luxurious designs, inspired by Britain’s rich cultural heritage. Rebecca also joins us soon for a week’s work experience, to see jewellery from a retail perspective. Bethany creates fine jewellery inspired by natural structures, with one particular collection inspired by antlers particularly impressing us. Bethany came to our Solihull store this week for a mentoring session, and will also be spending a few days with one of our favourite designers – Chloe Moss, from ChloBo – to learn more about the design side of the business. British designers are very important to us here at Fabulous, with collections from Vivienne Westwood, Lulu Guinness, Chloe Moss, James Boyd and Chris Lewis all helping make us the go-to place for must-have brands. So, we’d love to see one of our winners becoming the next big thing in the industry in the future! Fabulous now stock MOOG watches! New to our watch collection this season is Moog, a brilliant French brand with interchangeable straps. This fabulously innovative watch collection has over 70 leather straps in an array of colours in a mix of patterns and textures that you can easily switch to style your watch for every occasion! Designer Hovel Chenorhokian creates beautiful watch dials in stainless steel with mother-of-pearl, gold plating and bold, Art Deco-inspired numbers and classic stone-set dials. These beautiful dials can then be worn with as many different straps as you like to match your moog to your mood! Moog watch straps slide easily through the back of your moog dial and are closed with a classic buckle design, making it easy to change the look of your watch to match any outfit, every season. Check out our full Moog collection in-store or online and start your collection today! If you love the relaxed, boho style of ChloBo, and the natural beauty of semi-precious stones from Lola Rose and Missoma, you’ll love Pranella jewellery! Pranella is new to fabulous this summer with a unique and affordable collection of hand made designs with stones carefully sourced from around the world. Mother and daughter team, Alex and Charlotte, are the creators of this jewellery brand which is made in their workshop in Newcastle. 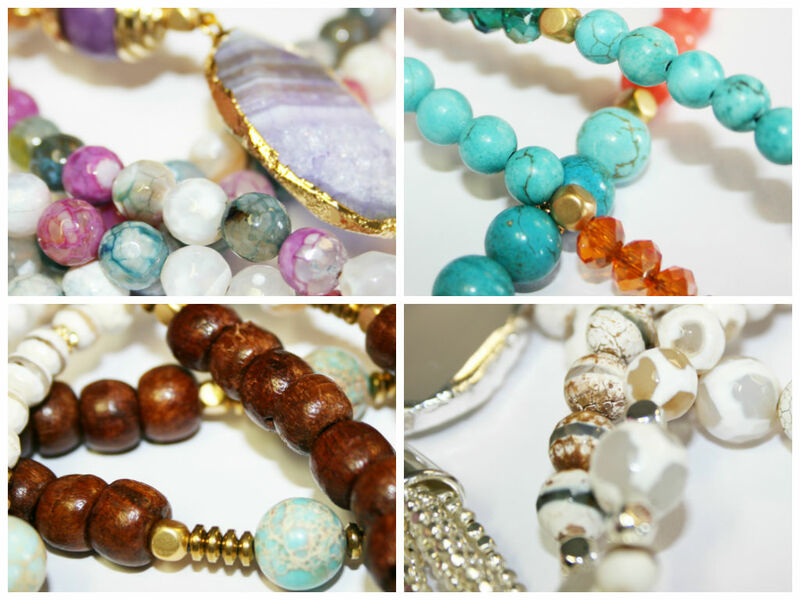 We have a beautiful selection of Pranella bracelets and necklaces in-stock, all featuring colourful beads, rough cut stones with gold leaf and silver. The necklaces can be worn long or wrapped for a shorter, layered look ideal for creating both day and evening looks. Each bracelet features colourful stones threaded onto elastic so that they can stretch to fit easily, with cute charms such as the popular Hamsa hand. These £20 bracelets are perfect for topping up your summer stack! Jo has added the beautiful Lavinia necklace to her jewellery collection for the summer! Shop this gorgeous collection online, or join us in-store and find your favourite! If you love mixing vintage with high street and admire a relaxed outlook on life, you’re a boho babe! Your dream summer consists of fabulous festivals and dancing under the stars at beach parties, as long as your feet are in the sand and you are surrounded by friends, you’re happy! Your summer look is relaxed, with fringing and natural materials taking centre stage, accessories are key to your look, with stacks of bangles and talisman jewellery a firm favourite. If you love pretty things that are girly and sentimental, you’re a pastel princess! Your dream summer consists of romantic City breaks and English garden parties. You love pastel shades and feminine clothes, your jewellery is both sentimental and girly and you love semi-precious stones in light shades with a touch of sparkle. Your dream holiday destinations are Paris and The Hamptons – chic, classic and romantic. If you believe things should be done in style and that one can never be over-dressed, you’re a glamourpuss! Your dream summer consists of glamorous parties and lots of outfit planning! You love to lounge by the pool with a bottle of bubbly and ‘people watch’ spotting inspiration for your next look. For you, accessories are luxurious and the perfect way to finish off a fabulous outfit. Your look is polished and your dream holiday destinations are St Tropez and Barbados, mixing with the A-list crowd.